I was browsing my fb photo album and I find the photo of my nephew and his eldest sister (my niece). The photo below is when my sister (mother of Vince) and her eldest daughter visited to Vince (the youngest brother) in my simple abode. My sister (mother of Vince) and her hubby was agreed to borrow Vince because we have no baby. My sister brought the bubbles for Vince as pasalubong (homecoming gift). They play the bubbles and happy to each other. 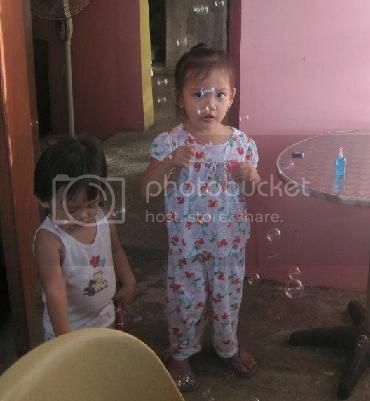 By the way, I was very happy to her pasalubong (homecoming gift) even it is cheap but it’s worth it to her kids because they really enjoy to play and to blow the bubbles, they really appreciate it. The bubbles have visible colors reflecting from the light, and when you touch the bubbles, it’s disappears. I think this is the reason why the kids enjoyed playing the bubbles. Every time Vince saw the bubbles vendors he asked me to buy; of course I will buy one for him because for me bubbles is a great way to gain eye contact and to develop the self-concept of a child. And the bubbles are fun for everyone and easy to use for the children.